Did you see that pothole on the 401? How about that nail on the road? Nope? Looks like you won't get home in time for your fitness class!.....It's been one of those days... You need the best tow truck service London Ontario has to offer. Let Charterhouse Towing London come to your assistance with fast, reliable and affordable towing for your vehicle as well as collision repair. That's right we are a one stop shop for all of your auto repair needs in London Ontario . We can tow you vehicle to our shop, repair whatever needs fixing, give you a loaner car if you need one or get you right back out on the road in no time. Give us a call and we can literally take care of everything for you! WE BUY AND SELL USED CARS! Looking for a quality used car at a great price? We buy and sell the best used cars in the city. Since we are a full-service auto repair shop we can buy vehicles and fix them here and provide warranties where applicable. We only deal with the bestused cars so our clients get top value. NEED A TOW TRUCK IN LONDON? We are proud to have served London, Woodstock, Dorchester, Strathroy and all surrounding areas for many years with top quality towing including the best prices for towing in the area. Call Charterhouse Towing, the best tow truck service in London and we are on our way to help. How many times have you said, "I need to find a tow truck near me!"? Simply click below and your phone will dial us up and the most reliable tow truck service in London Ontario is on its way. At Charterhouse Towing London we pride ourselves when it comes to prompt, professional tow truck service without compromising exceptional quality. We understand that if you need us to tow your vehicle, deliver some gas, or help you gain entry to your car you are already having a bad day and are likely stressed about the situation. We promise to treat the situation like it was a family member in distress and when you call we are on our way. We offer the professional towing service you deserve. No one likes spending their hard earned money on car repairs, especially when they were not your fault. We understand that having to call us is the last thing you want to do so when Charterhouse Towing service shows up to help it is the very least we can do to treat you professionally and work promptly to remedy the situation. We only offer honest, fair pricing for the best tow truck service in London you could have. Nothing more. No hidden fees, no up sell, no looking for more work. We show up, do our job and hope you are so satisfied that we get your business again and you refer us to your friends. Nothing would make us happier to have a happy customer at the end of a stressful evening and that's why we believe we are the best tow truck service in London and all surrounding areas. No situation is too small to show a little discretion and compassion for our customers. Did you come out of the mall and realize your keys were locked in your car the whole time? Can’t figure out how to get that pesky spare unhinged from the trunk? How about you forgot to stop at the gas station on the way to their golf lesson and now your kids are screaming at you from the back seat. 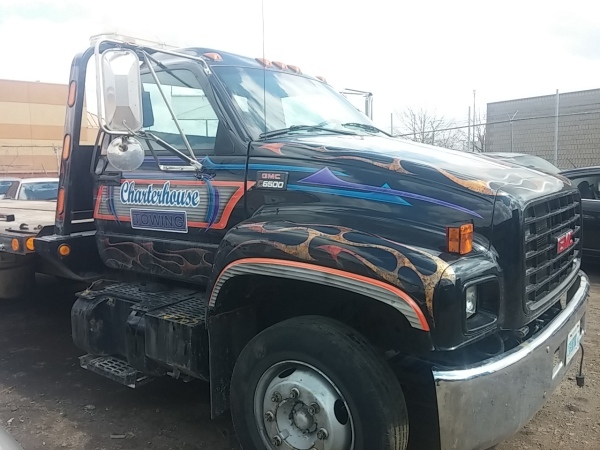 Call Charterhouse Towing service and we promise to get there quick, be discreet and not make anyone feel silly for getting caught up in the madness of your day. True professionalism is what you will receive with the best towing company in the London area – Charterhouse Towing London. One of our drivers even had to retrieve a custom designed engagement ring from a locked car just to keep the elaborate proposal on track one day! Call us today and let us prove it to you. Experience. We hold our team of drivers to the highest of standards. All team members are fully trained, courteous, and friendly. Put your trust in us and let us deliver the service you need with the professionalism you deserve. Best Tow Truck Service in London Ontario! We have the absolute best towing rate in London. Give us a call or email to find out our best rate for your circumstance or project. Want to Request Something Special? Don't be afraid to ask! We have towed/moved everything under the sun. Send us your request and we will do our best to ​ accomodate you. If we can't do it we will try to find someone for you that can!